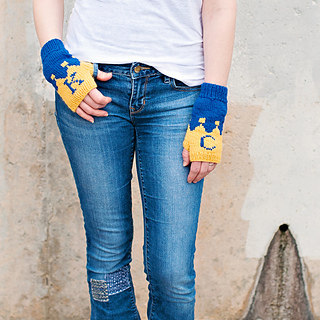 Celebrate your Kansas City pride with a pair of clever Crown Town Mitts! Pattern is knit seamlessly, bottom-up in sport weight yarn, with a simple stranded crown, and duplicate stitched initials. 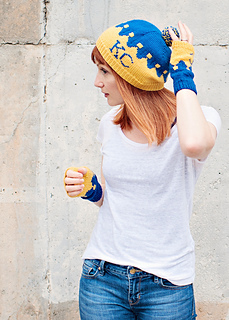 Pattern includes four sizes to fit KC lovers of all ages! 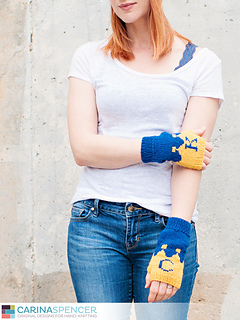 Pattern is written for 4 sizes to accommodate kids and adults. Directions are given for Child size with changes for larger sizes in parentheses as follows: Child (Adult S, Adult M/L, Adult XL). To find your size, measure around your palm above the crook of your thumb. Choose the size that’s circumference is closest to - a little bit of negative ease is fine. Sample shown is Adult S on a 7½” palm circumference with ½” negative ease. NEEDLES: dpns in US 5 (3.75 mm) & 3 (3.25 mm) OR size required to obtain gauge and two sizes smaller. NOTIONS: darning needle for duplicate st and weaving ends. With larger needle, 26 sts and 34 rnds = 4” (10 cm) in stockinette after blocking.